The man who designed and lived in my house in 1912 had to be a world traveler and an avid botanist because the fruit trees that adorned the entire property were unusual varieties, among them a plum tree, whose red pulp fragrances emanated a perfume that was previously unknown and made the place full of charm. When I was a small, the tree already was forty years old and was huge and had all the signs of storms that had their fun breaking its branches and leaving the leaves all over the ground. Despite all this the tree managed to take me up to adolescence and finally gave up and in the spring it no longer awoke. For many years we have tried this plant nurseries, but only in recent years has appeared this variety. So now there is a new Santa Rosa plum tree in our yard. This tree was bred by a pioneer of the science of agriculture, Luther Burbank, in Santa Rosa California in 1906. Maybe it was for these American origins that immediately attracted Colleen to this fruit. The following recipe was made by her. Combine the red wine, clove, peppercorns, vanilla and sugar in a saucepan. Bring to a boil, reduce the heat and simmer 5 minutes. Remove from the heat and strain into a bowl. Allow to cool. 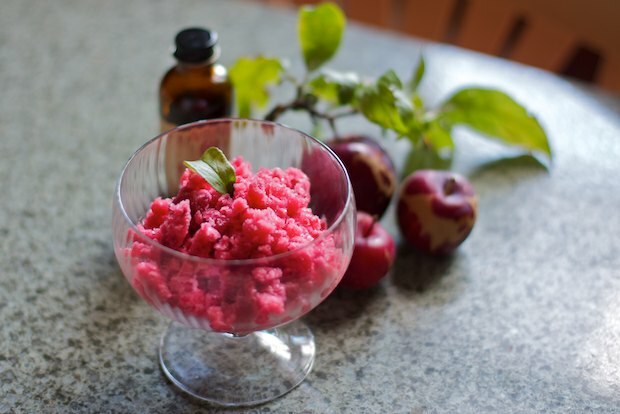 Blend the plums with the honey and wine syrup in a blender until smooth. Chill for 2 hours or overnight. Place a baking dish in the freezer. Scrape into the chilled baking dish and place back in the freezer. Set the timer for 30 minutes. Using a fork, scrape the ice crystals from the outside of the baking dish toward the center. Return to the freezer and set the timer for another 30 minutes. Continue to scrape the mixture with a fork every 30 minutes until you have a uniform frozen mixture. It should not be frozen solid. If you forget to scrape and the mixture does freeze like an ice cube, cut into chunks and use a food processor fitted with the steel blade to break it up. Transfer to a container and freeze. Allow to soften for 15 minutes in the refrigerator before serving.